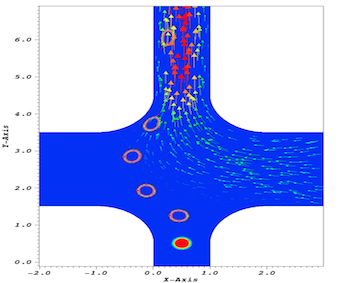 In this 2-year postdoc project we adopted a two-phase flow model for 3D simulation of the motion of red cells in a microfluidic device for cell sorting. The aim was to develop a sufficiently accurate simulation tool, which would be useful in the development and design of microfluidic devices for lab-on-a chip applications. A large part of the work was to develop a massively parallel finite element code in the deal2 software framework. The project was a collaboration between the two-phase flow group in scientific computing and the Micro systems technology group, headed by Klas Hjort, at the information technology and the engineering science departments, respectively.